The Stabyhoun is a loving, loyal and active family dog. Originally from the forest area of Friesland, the Stabyhoun (also known as the Frisian Pointer and Friese Stabij) became increasingly popular across the Netherlands during the sixties. In 2012, a programme to introduce the Stabyhoun to the UK was launched by the UK Stabyhoun Association. There are now more than 100 Stabyhoun in the country, and puppies are fully pedigree registered with the Dutch Kennel Club (Raad van Beheer). On this site you will find information about the breed, about how to go about getting a Stabyhoun puppy and the efforts that go into breeding and maintaining a healthy population. 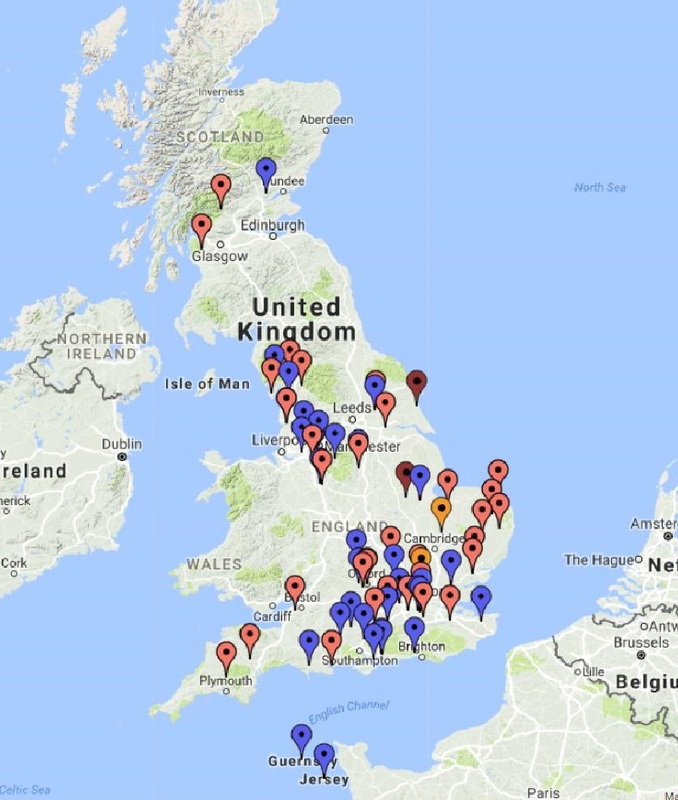 Click here to see where your nearest Stabyhoun lives and fill in our visiting request form if you are interested in meeting one. 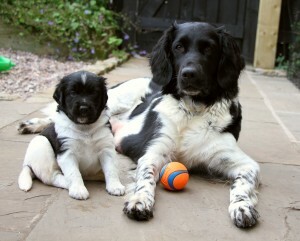 That is the first step to getting a Stabyhoun puppy in the UK. Please note: There are no plans to seek UK kennel club recognition of the Stabyhoun. Our focus is on establishing a healthy and diverse population of dogs, with help from the breed experts in the Netherlands. This, to us, means supporting and empowering families to breed from as many healthy and approved dogs as possible, and making the most sensible combinations possible – avoiding an unhelpful focus on producing ‘Best of Breed’ and show champions. If participating in dogs shows is a key interest of yours, then this is most likely not the breed for you. Texts from the nineteenth century describe a ‘long-haired piebald’, which was often ‘a child’s friend’ and a ‘good hunting dog’. Although the Stabyhoun most likely shares common ancestors with the Spaniel, Small Munsterlander, and the Drentsche Patrijshond this is today an entirely unique breed of dog and typically somewhat less intense and hectic than those breeds. Originally praised for their skilled mole and rat hunting abilities, as a watchdog and as a pest exterminator around the family home, the Stabyhoun was also occasionally trained as a hunting dog for wild hare and upland birds. This was a breed for the humble farmer and small landholder, not the nobility. Today, the breed remains understated; a versatile family and companion dog with the potential to work alongside hunters, in the agility ring and other sports. As the official association for the Stabyhoun in the UK, the UKSA has been approved by the original Dutch Stabyhoun Association (NVSW) to manage import and breeding of these wonderful dogs in England, Wales and Scotland. Although this is a very rare breed, puppies are now born in England each year. In addition, we continue to import carefully selected and well-raised puppies to build a genetically healthy and diverse population. Visit our puppy page for details about how to apply. Although the ‘Stabij’ shares many skills and behavioural characteristics with, for example, the Labrador, Golden Retriever, Spaniel, Munsterlander and Duck Tolling Retriever, it remains an entirely unique breed of dog with a more thoughtful and less hectic nature. This is a truly wonderful family dog which is growing in popularity across Europe and North America. Its sensitive nature makes it great with children and other animals although it is not the most confident of the working breeds. Where a spaniel may launch into hedges to see what’s there, the Stabij often considers his options first. With positive, consistent and gentle training, the Friese Stabij can become the most amazing, reliable and steady dog in for example the agility ring, on the field or, as you can see by following the link below, at Heelwork to Music (HTM). The Fédération Cynologique Internationale (FCI) recognises the Stabyhound as a purebred pedigree breed of dog and has classed it as a spaniel type pointer. Its name translates to ‘Stand By Me’ which is the reason it is a much loved breed in its native country. The Stabyhoun was formally recognised by the Dutch Kennel Club in 1942. It belongs in the FCI Group 7, Pointing Dogs. 1. To promote the Stabyhoun as an active family dog in England, Scotland and Wales. 2. To require members and breeders to accept the standard of the breed as approved by the Nederlandse Vereniging voor Stabij- en Wetterhounen (Dutch Association for the Stabyhoun and Wetterhoun hereinafter referred to as the NVSW) as the only standard of excellence by which the Stabyhoun shall be judged. 3. To encourage and promote the physical health, temperament and quality in the breeding of the purebred Stabyhoun with advice from established breed experts and associations. 4. To encourage all UK Stabyhoun owners to attend the annual UKSA Stabyhoun Social and Breed Assessment Day along with other workshops and training days that promote good dog ownership – including relevant breed events in the Netherlands. 5. To conduct sanctioned events such as the annual UKSA Social and Breed Assessment Day. 6. To do all in its power to protect and advance the interests of the Stabyhoun breed in the UK by encouraging sportsmanlike competition at dog shows, obedience trials, field trials, agility and at all other competitions. 7. 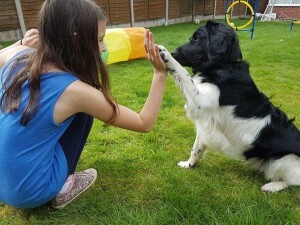 To educate potential owners about the characteristics and demands of the Stabyhoun and provide advice on all aspects of health, diet, training and welfare. 9. To provide support for all owners of this unique breed, including advice on health, diet, training and general welfare.